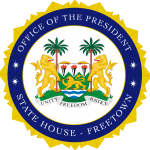 State House, Freetown, Thursday 14 February 2019 – A high-level delegation from the West African Examination Council, WAEC, headed by its Chairman, Baboucarr Bouy from the Republic of Gambia, has met with His Excellency President Julius Maada Bio at State House. Mr. Bouy said that WAEC had executed its mandate creditably for 66 years in all the member countries and remained the only surviving sub-regional organisation among those established in pre-independence West Africa and had remained the most credible and one of the strongest chords that keep the five Anglophone member countries together. He expressed appreciation to some Sierra Leoneans who had contributed, in no small measures, to make the institution the bridge that linked the education sector of member countries, offering the unique opportunity to plan and work together, and forge ahead together as a people with the same educational destiny. The WAEC Chairman also disclosed that the organisation had accorded Sierra Leone the opportunity to host its 67th Annual Council Meeting this year, adding that the delegates were looking forward to the event with the expectation of a great performance by the country, especially given the premium that the new administration had placed on education. “WAEC appreciates the commitment and supports the Government and people of Sierra Leone. We hope and pray that nothing will diminish the stature of the existing relationship between this country and our organisation. Be assured that WAEC is irrevocably committed to ensuring that it does not, in any way, disappoint the government and people of Sierra Leone,” he said. On his part, President Bio said Sierra Leone had been a part of the examination body and, that as a party to the council, the country had some responsibilities but was faced with challenges, assuring, however, that as a new government they were committed to working with them and willing to be a responsible party going forward. He informed the delegation that his government’s flagship project was education, a major component of developing the country’s human capital. He said for him the most important investment in human beings was education and described it as the universal key to unlock opportunities and surmount challenges. He added that his government had taken bold steps in transforming words into actions by providing free quality education for every child. “As a nation, we were once referred to as the Athens of West Africa but through carelessness, we slipped off that position and now we are trying to get back there. It is challenging but we will get there. So far, we are doing well to implement the programme in five months. The education is free but we also want to ensure the standard is competitive around the world. “We want to appeal to make sure the standard is maintained in education, which is our main concern. We have been quite concerned with a variety of issues surrounding integrity, issues for which we count on you to make sure that those issues are properly addressed so that our kids can have a quality education,” he said.